This review is of the new A350XWB business class service from Addis Ababa Bole Airport to London Heathrow Terminal 2 on departure ET710. Since that was an overnight flight and this was a day flight, I thought it worthwhile to write a second review concentrating more on the food and service. There are a lot of images at the end of this review in a slideshow, of both economy and business class. To find out general details on the A350XWB service and about Ethiopian’s plans, it’s new fleet (including A330s and B787 Dreamliners see our earlier pieces (simply click on the Ethiopian Airlines tag). We arrived early at Addis Ababa Bole airport at around 0830. To keep this review short(er), I’ve put the pictures and thoughts about the airport and lounge in a separate review. It’s worth looking at that, especially since there are a choice of lounges, and if you want to buy anything at the airport it might contain some useful advice. This was confusing. There is a dedicated Star Alliance Gold boarding door almost opposite the lounge. If you go through this it is quicker, but then you have to walk the length of the airport on the other side of a glass divider before getting to Gate 5 where you then have to join the queue and be subject to random checks (this is where they confiscate the alcohol you have bought). You then join a general scrum, and unless you are prepared to push through the crowd the empty line on the other side of the fence for Cloud 9 business class passengers is likely to be of little use. Once you have got through here, you then join the queue on the air bridge. Finally, we boarded. Once on board we were offered a choice of water, orange juice or Champagne, though I saw one passenger being served either a Tomato juice or a Bloody Mary, so perhaps the choice is wider. My jacket was hung up and since the IFE system was already working I had a look through the available choice, which includes some Ethiopian films including The Lamb as well as Hollywood and Bollywood ones. The business class cabin has 30 seats in five rows of 6 (AC-DG-JK). Economy is 313 seats. This total of 343 seats is more than Ethiopians two class B787-8 aircraft (24/240) but less than the B777-200LR (34/287) or B777-300ER (34/346), both of which have been seen on the daily London Heathrow to Addis Ababa route. 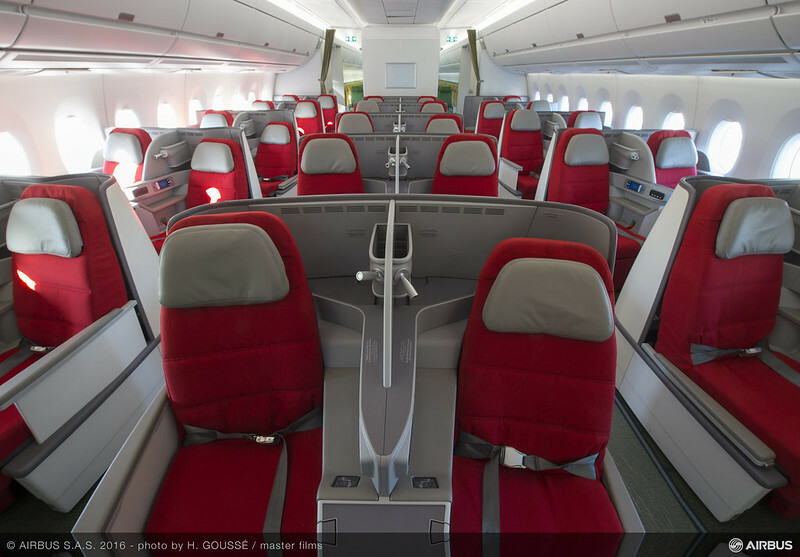 The seats are in red leather and recline fully-flat. They have in-seat power and USB charging. We were told that the A350s have been delivered to Ethiopian with the capacity for internet access and this will come online for passengers later in the year. At the moment, however, there is no internet access which is a shame on a day flight like this when you could get a lot of work done. That said, I still worked for the whole flight using the in-seat power. As we were waiting to pull away, Ethiopian’s brand new second A350XWB pulled up alongside. You can store bags under the footstool for take-off and landing, which is useful. There is no overhead storage for the central seats, which means it can get full overhead, especially when some passengers stow their carry-on bags sideways rather than long ways, as these new, more spacious bins allow. The tray table folds out from the central arm rest and is a good size and quite stable. It slides forwards and backwards so you can put it in the right position for working at. The flight was only half full on this day time flight and it gave me time to see the difference between the seats – and there is a big difference. Most seats have a limited amount of room for your feet in the footstool (see above for the picture from seat 2D). The main exception to this is in the front row. That is the room you get in 1D. So the seats with the most foot room (and so sleep room if you want to shift around when sleeping) are in the front row – so while I would normally say avoid the first row, it’s worth considering even if there is some noise from the galley. In contrast to the flight from Heathrow, we were given a dedicated drinks menu, which was welcome. Weirdly, though, there were no Ethiopian wines listed, but in fact they were on the trolley, including both white and red wines from the Rift Valley. As well as listing the liquors including Johnnie Walker Black Label, Baileys, Cointreau etc… it also had details of the wines. Having said that, we were offered Ethiopian wines (from the Rift Valley) but they were not on the menu. Saba Tej – which is the Ethiopian speciality produced from wild honey and woody herbal hops. But neither were available, a real missed opportunity for promoting Ethiopian drinks. There was also a beer Habesha and non-alcoholic Bavaria. This wasn’t chilled so the flight attendant chilled it for me and then, on request, served it in a glass with some ice. It was a very helpful attitude continued throughout the flight. There was also an Express meal option for those who wanted their food quickly and then to go to sleep. After a while I reclined my seat and slept for a while – it’s a comfortable bed and a large blanket is provided along with a pillow which I supplemented with a pillow from the empty, neighbouring seat. Just as on the night flight on the way over, I had no trouble with it and found the seat cushion comfortable when it was reclined into a bed. Lentil ragout with sautéed spinach and rice. For dessert there was a chocolate ganache tartlet and a choice of cheese or fruit. All the food was delicious – I was impressed – especially by the Ethiopian National dish – I’d eaten a version of this in a restaurant in Addis the night before and this was on a par. This was a good flight – the staff were friendly and attentive, I like the seat (particularly the front row), and the food and drink were worth staying awake for. I think Ethiopian could do even more pushing things like the coffee (which is the best in the world) and their wine (which isn’t, but is perfectly drinkable and something different. It also should make sure that the national drinks are on board. Someone at the airline said they were aiming to be a four-star airline with five-star service. They definitely offered the latter, and the former with these new aircraft is easily achievable and was on both of our flights – both overnight and during the day.